Your wedding, and the days leading up to it, are some of the most special of your life. In the midst of preparation, your heart swells in the joy of having your loved ones with you to support and love you as you take this most important step. Your thoughts travel from your sweet childhood memories, to more recent experiences as you recall all the how much your parents have done for you. Traditionally, the betrothed couple presents their parents with a gift of thanks before or at the wedding ceremony. 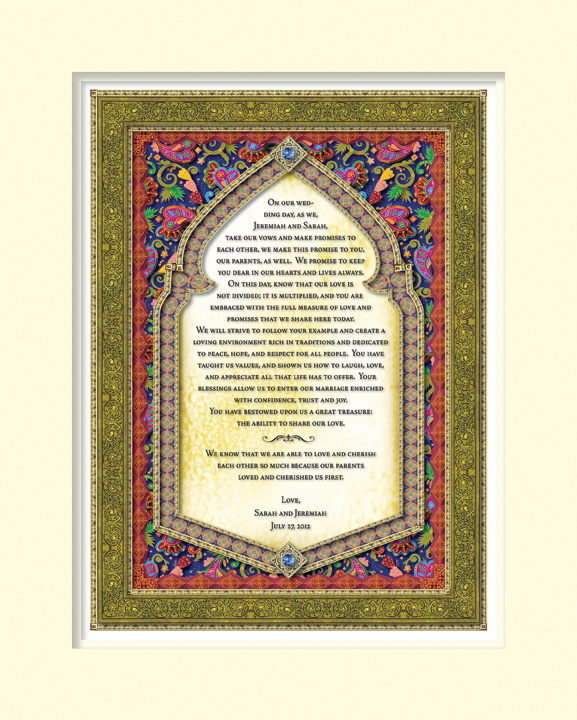 Honor you parents with true words of heartfelt gratitude captured in a beautiful, unique piece of art. It will be a keepsake that they will treasure for generations.